Myasthenia Gravis (miastenia grave, lee la version en Español aquí) is an incurable disease of the immune system that produces severe weakness because of the loss of muscle control in different areas of the body. It is sometimes called “rag doll syndrome” because the people who suffer it loose control of the so called “voluntary muscles”, which include the eyes, the throat, the chest, the extremities, among others. Patients are also called “snowflakes” because there are no two patients alike. Until it was discovered that the symptoms of this disease could be treated with corticosteroids, two thirds of the patients continued to degenerate, half of which, or one third of the total, died because of this disease. Even though science has improved its understanding of the disease, it is still a rare and practically unknown disease, not only among the population, but even among health professionals. The number one complaint of MG patients is related to the time it took, the amount of appointments, doctors and wrong diagnoses the they had from the time the first symptoms appeared until they finally were given the right diagnosis; in the majority of the cases, many years passed. Maybe you don’t care, because you don’t know anybody with Myasthenia Gravis… at some point I will tell you my whole story, including how the hand of God has been manifest in my disease from beginning to end; for now, let me tell you that I have suffered this disease for decades, I have been seen by dozens of doctors, from small town doctors to doctors from one of the best hospitals in the world, and I have been incorrectly diagnosed and treated for myelitis, fatigue, central sleep apnea, pneumonia (several times), ischemia (lack of irrigation of parts of the heart muscle, pretty bad stuff), migraine, physical therapy for my shoulders, all kinds of allergies, visits to urgent care and the emergency room with suspicion of lung cancer, aneurism/stroke… and none of these doctors ever suspected the real root of all my symptoms. Even after I did my own research and self-diagnosed with MG, my doctor wouldn’t believe it… I had to write all the symptoms of my whole life to convince her to send me for a study at the Myasthenia Gravis Clinic of Duke University, where they finally confirmed my diagnosis and started the treatment that has given me my life back. In his mercy, God Almighty has sustained me during the most difficult moments and has strengthen me so my faith wouldn’t falter. Today I have recovered almost 90% to 95% of my strength and live a normal life for all practical purposes, with one exception… the treatment consists on destroying my immune system… I don’t have defenses anymore and any simple virus or bacteria could potentially mean a trip to the emergency room… kisses, hugs, and specially handshakes are forbidden, but I have been able to get back to playing volleyball, go up stairs and maintain a healthy level of activity. Myasthenia Gravis… don’t forget, it is an incurable disease, but with an adequate treatment one can go back to a relatively normal life… but, if people don’t know about the disease, and what is worse, health professionals continue to ignore the facts about this grave disease… many more patients will continue to suffer and even die in vain. 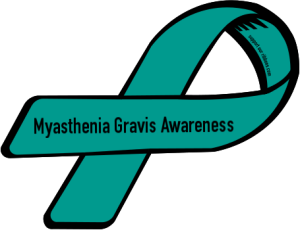 Therefore, the month of June has been declared Myasthenia Gravis awareness month… help me pass the message!